Mere moments after being selected to lead the Catholic Church in his role as 266th pope, Jorge Bergoglio, now Pope Francis, quietly let the world know that his papacy wouldn’t be business as usual. Rejecting a ride in a luxurious, privately chauffeured vehicle to “go with the guys on the bus” and making a quick detour to pay the bill for the modest guesthouse where he had been staying during the conclave: these two acts on his first day as pope conveyed Francis’s “of the people” posture, one that has come to define his tenure. 1.) Pope Francis decided not to live in the papal palace. Every pope since 1903 has lived in the papal apartments of the Apostolic Palace, a spacious, luxurious spread fit for royalty. Francis, however, decided to deviate from that tradition, opting for a much more modest apartment nearby, accommodations that are in keeping with his vow of poverty. Pope Francis has repeatedly asserted that the Church and its leaders must set an example by acting in a manner that is consistent with its values. “How I would like a Church that is poor and for the poor,” he has said. Leading by example, he has eschewed the gilded trappings of his post and has consistently encouraged other representatives of the Church to do the same. 2.) Pope Francis washed the feet of imprisoned men and women just 15 days into the papacy. When he was the archbishop of Buenos Aires, Argentina, he established an annual tradition: entering a jail or prison to enact symbolically the Holy Thursday ritual of washing the feet of Jesus’s disciples. The world was moved when, just 15 days into the papacy, Francis arrived at Rome’s Casal del Marmo, a detention center housing 14- to 21-year-olds, many of them immigrants and refugees. There he washed the feet of 12 people; two of them were women, and several were Orthodox or Muslim. The gesture established a tone of class and religious inclusiveness that has characterized his time as pope. 3.) Pope Francis has censured Church representatives who don’t uphold its values . . . The most notable — and perhaps most publicized — example was his removal of Germany’s “Bishop of Bling,” Monsignor Franz-Peter Tebartz-van Elst, from his post. The monsignor, who was the subject of a Vatican inquiry, reportedly spent $43 million on his residence, including $20,000 for a bathtub and $620,000 to purchase artwork. 4.) . . . and he has subjected the Vatican to unprecedented financial scrutiny. In the past, the notorious secrecy and insularity of the Vatican were exceeded only by the notorious secrecy and insularity of the Vatican’s treasury, which was believed to be corrupt, laundering money and evading taxes. Pope Francis’s desire to make the treasury more transparent has become a pet project. He created a Secretariat for the Economy and appointed Australian cardinal George Pell, a Vatican outsider, to head it. Pell said, “Our ambition is to become something of a model of financial management, rather than a cause for occasional scandal.” During his tenure, Pell has introduced numerous far-reaching reforms and has shut down suspicious accounts. 5.) Pope Francis said, “Who am I to judge?” when asked about his stance on homosexuality. The pope surprised conservatives and liberals alike when he uttered the now-famous phrase, “Who am I to judge?” in response to a question about how he views gay priests. While he has never deviated from Church doctrine on the point of homosexuality, and while LGBT activists and allies wish he’d take a still more outspoken stance, his simple statement certainly distinguished him from previous pontiffs. 6.) Pope Francis uses social media to reach more of the masses. He wasn’t the first pope to tweet (that was Pope Benedict XVI), but Pope Francis has had a robust presence on social media, tweeting messages of faith and comfort to the masses from multiple accounts (one each in English, Spanish, Portuguese, Italian, German, French, Latin, Polish, and Arabic). His English-language account alone has 6.9 million followers. 7.) Pope Francis made the Cuba–US detente possible. Fifty-five years is a long time to hold a grudge. Despite the fact that President Obama had intimated that he wanted closer ties with Cuba, it wasn’t until Pope Francis brought Presidents Obama and Castro together that the wheels were set in motion for a historic detente, announced in December 2014. Reportedly, the negotiations began only after Pope Francis sent a letter to both presidents, calling on them to work to release men who were being held by each country as political prisoners. The pope then invited the presidents to the Vatican. A delegation from each country met there and engaged in mediation with the pope in October 2014. 8.) Pope Francis confronted climate change. 9.) Pope Francis has made all people a priority. From visiting slums in Brazil and Paraguay to addressing humanitarian crises among refugees to apologizing for the Church’s crimes against indigenous people, Pope Francis has demonstrated both historical memory and awareness of current events, reminding those human beings who are typically overlooked that he has not forgotten them. What is your favorite moment of Pope Francis’s papacy? Tweet us @collazoprojects and @NewWorldLibrary. 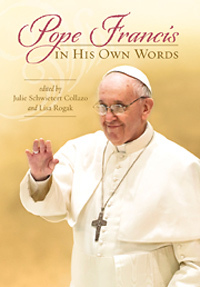 Julie Schwietert Collazo is coeditor, along with Lisa Rogak, of Pope Francis in His Own Words. She has written for a variety of magazines, including Time, National Geographic Traveler, and Latina, reporting widely on Latin America. She lives in New York, though she has called San Juan, Puerto Rico, and Mexico City home as well. Her blog is www.collazoprojects.com.